It all comes down to this… it is National Signing Day for these uncommitted recruits. These are the top remaining recruits on Alabama’s board and the prediction on where they will be committing.. This page will be updated as they commit. COMMITMENT: Auburn was able to go into Georgia and get a great defensive lineman. COMMITMENT: Davis decides to follow the Alabama legacy as his dad was the all time leading tackler for Alabama. A big major commitment from the Tide. Alabama has been trending big time for Mique Juarez. He took a visit on January 22nd and then right after Nick Saban made an in home visit to see him in California. This will be very close as UCLA has been the favorite and Ole Miss has an outside shot. I think he ends up staying in the state, but the Tide will make it close. COMMITMENT: UCLA ended up keeping Juarez close to home keeping him away from Alabama and UCLA. Kongbo is the top uncommitted JUCO recruit out there and will be a huge piece to any recruiting class. After having some momentum early, Alabama chances have soured recently. It looks like this will come down to Tennessee, USC, Florida State, and Ole Miss. I think the late visit to USC helps, but Kongbo stays with his original Tennessee commitment. COMMITMENT: The original Tennessee commit stuck with the Vols. USC made a late push, but Kongbo should play right away on the Vols defensive line. COMMITMENT: Not getting an official visit ended up hurting the Tide as Georgia won the battle for one of the best players in the country. Hardman should come into Georgia right away and compete for playing time. COMMITMENT: Shaun Dion Hamilton and Ben Davis were huge pieces in getting Mack Wilson to Tuscaloosa. It was a huge recruiting win getting Wilson to commit to Alabama. COMMITMENT: Big surprise Mississippi State was able to beat out both Alabama and Ole Miss. He decided to stay in the state and will most likely play right away. Jack Jones is an exciting defensive back from California. Alabama has been trending with the smaller defensive back, but he is most likely to stay in California. His final three are Alabama, USC, and Texas A&M. However, it looks like he is going to be staying in state. COMMITMENT: A.J. Brown stays in the state of Mississippi. Ole Miss did a great job going into Starkville and pulling Brown out. 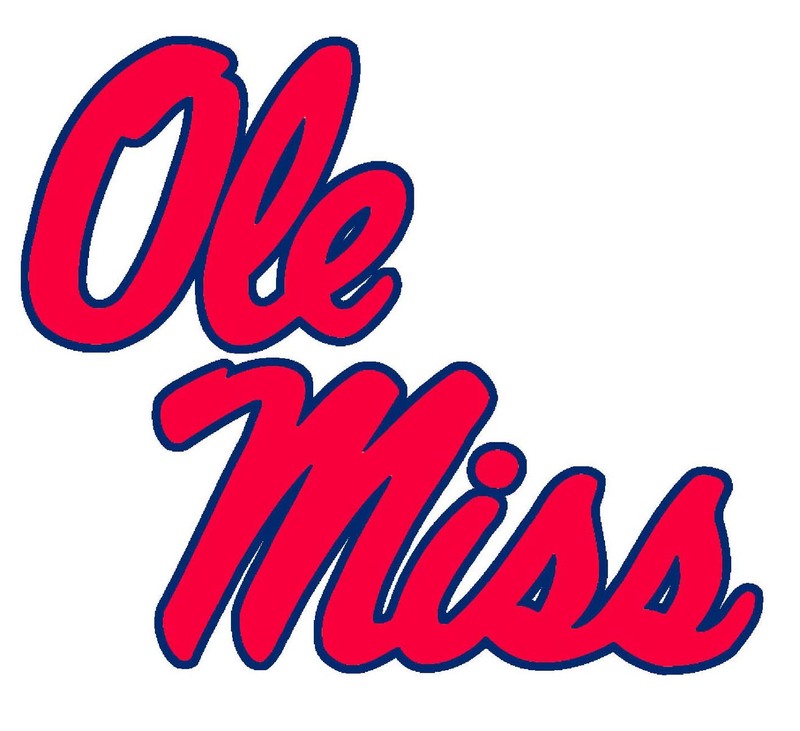 Great addition for Ole Miss. COMMITMENT: Unbelievable job by Coach Harbaugh to pull the top tight end in California out of the state. He is a huge get who could end up switching to the defensive line. Dickerson’s recruitment really started looking like an Alabama lean after his January 22nd official visit. However, most of his recruitment Florida State was looked at as the favorite and it actually looks like they have some late momentum. It will be hard for Alabama to beat Florida State with the momentum they are going into National Signing Day . Tennessee is the dark horse in this race. His finalist are Florida State, Alabama, Auburn, Tennessee, and Florida. 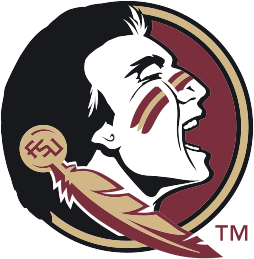 COMMITMENT: Florida State adds more much needed offensive line help. The Seminoles were able to keep the momentum through out the process for Dickerson. COMMITMENT: No surprise here for the Tennessee legacy. A big get for the Vols. Commitment: Alabama’s first cornerback commit is a big win, getting him away from the state of Mississippi. Knott has great speed and is a big part of the 2016 class. COMMITMENT: A great edge rusher with rare length Alabama is getting a great defensive end. They were able to beat out Florida State and Maryland. Commitment: Another big win for Alabama as Mayden decided to join Alabama instead of Oklahoma. Commitment: In the battle of the in-state schools Oklahoma State won out. COMMITMENT: Williams is a very good get at a position of need for Florida State. Florida State held off the late rush from other teams. COMMITMENT: After decommiting a few months ago, Alabama really looked like the destination. However, the hiring of Mark Richt was major for Miami keeping Richards. COMMITMENT: Jones was too tough to get out of Starkville as he committed to the hometown team. Commitment: A major upset for Oklahoma as it was considered an Alabama and Ole Miss battle. Commitment: Alabama gains a much needed offensive tackle for depth. Lashley has a high ceiling and has the ability to be developed into the next starting tackle. Another big win for Alabama, getting another recruit from the state of Mississippi. COMMITMENT: Ole Miss got a huge addition with Mathis as they beat out Florida for the great tight end. COMMITMENT: Keyshawn Young aka “Pie” announced that he will be attending USC. USC made a great push to beat out Michigan for this wide receiver. COMMITMENT: Alabama was looked as the leader. Alabama held off Ohio State for this JUCO sleeper. Lane Kiffin has a major challenge returning this offense to last year’s form with only starters OT Cam Robinson, OC Ryan Kelly and TE OJ Howard returning. It will all start at the quarterback position where a starter still has not been named between Senior Jake Coker, Redshirt Freshman David Cornwell, and True Freshman Blake Barnett. Whoever takes the reigns as the Crimson Tides next quarterback will be a key factor in how the offense performs. 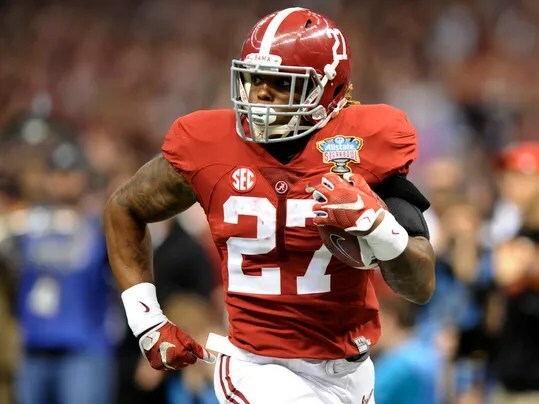 With a new quarterback under center, the running game will be heavy relied on particularly on Heisman candidate Derrick Henry. After rushing for 990 yards last year as a complimentary back to T.J. Yeldon, look for Henry to get a larger share of the carries. Alabama should also work to get Henry more involved in the passing game as he has only 6 catches over the past two years for a ridiculous 194 yards and a 32.3 average. Kenyan Drake should have an impact also as he returns from injury last year. Drake is very versatile and Kiffin likes lining him up in different positions as seen by his touchdown catch against Florida last year. After those two running backs, the Crimson Tide is highly inexperienced. The Tide do however have the top high school running back in Damien Harris coming to Tuscaloosa where he could make an impact early. As for the wide receiver position, the competition remains wide open after the loss of Cooper, White and Jones. After spring practice Robert Foster looks like the clear leader of the group. He led all receivers in the Crimson Tide’s spring game with 6 catches for 125 yards. After Foster the competition is wide open with ArDarius Stewart, Chris Black, Raheem Falkins and Derek Kief all vying for starting spots. Alabama also has a graduate transfer coming from Oregon State in Richard Mullaney. Mullaney finished his career with 1160 yards and 5 TDs, his best year was his junior year where he finished with 52 catches and 788 yards. The wide receiving position battle being wide open it may offer a chance for an incoming freshman to make an impact. Calvin Ridley could be that guy as he is coming in as a top 25 national recruit. He won MVP at the Nike Opening Camp where the top football players from around the nation come to compete. Ridley’s high school campaign was actually shortened because of an age restriction. 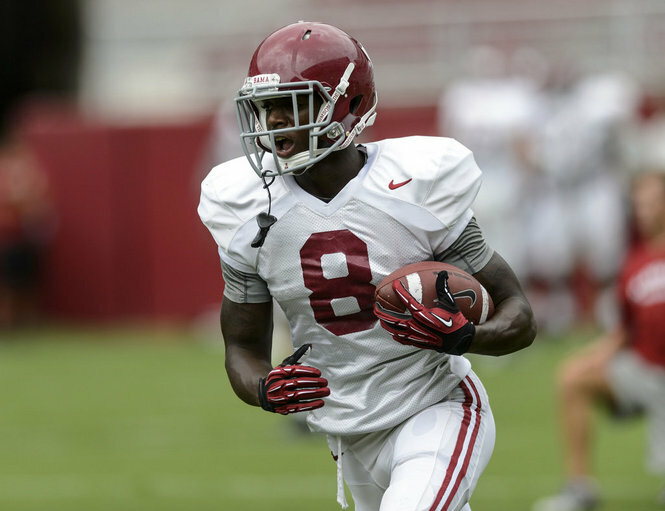 Calvin Ridley will actually be an older freshman as he will turn 21 before the season ends. Look for Ridley to compete for playing time and be an impact freshman. With the receivers being relatively inexperienced O.J. Howard will be called upon to step up from his 17 catches last year. Ty Flournoy-Smith adds additional depth at the tight end position. For the first time in quite a while the offensive line is a bit of a question mark. 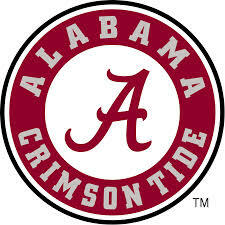 Alabama does have pre-season all SEC offensive lineman Cam Robinson and Ryan Kelly returning, but they will have to replace three starting spots. Redshirt Freshman Ross Pierschbacher and Bradley Bozeman look to step in at the offensive guards spots. Pierschbacher was a highly rated recruit out of high school and Bozeman stepped in and started two games last year when Ryan Kelly was hurt. Dominick Jackson will hold down the other spot at right tackle and it is hard to miss him. At 6’6 and 315 pounds, Jackson was the top rated Junior College offensive tackle in the country in 2014 as well as Rivals second rated JUCO player overall. Last year he had limited playing time, but now will be called upon to start at right tackle. The way this offensive line develops will be monumental for how the Alabama offense performs. Alabama’s Defense comes into the season loaded along the defensive front with arguably the best front 7 in the country. It starts on the defensive line where the Tide are led by A’Shawn Robinson. Robinson has been an impact player since he was a freshman and now as he enters his junior season he looks ready to take his game to new heights. Look for him to be not only one of the best defensive lineman in the SEC, but the country as well. 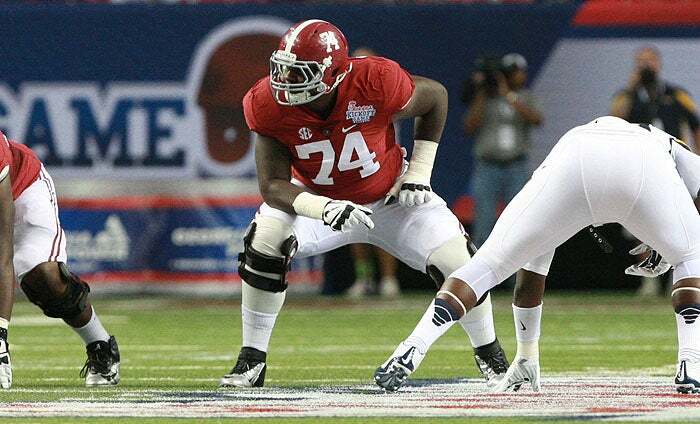 Along with Robinson, Jarran Reed is an excellent defensive lineman in his own right. After having the chance to go pro after a breakout junior season, Reed decided to return to Alabama where he led defensive lineman with 55 tackles last year. Completing the three man starting defensive line is Jonathan Allen who added a breakout season of his own last year. Finishing with 6 sacks and 14.5 tackles for loss, Allen gives the Tide a much needed pass rusher. The Alabama defensive line is deeply talented as well, with DJ Pettway, Darren Lake and Dalvin Tomlinson all have playing experience. Look for the talented Da’Shawn Hand to have an increased roll after he saw some action during his freshman year stint. At the Linebacker position it starts and ends with Reggie Ragland. 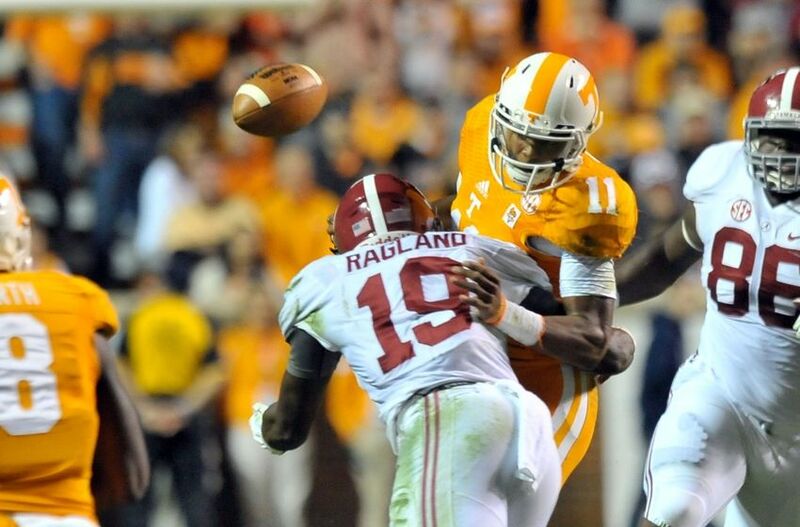 After turning down the NFL where he had the potential to be an early round draft pick, Ragland is back to leading the Tide. Ragland will be a Butkus award contender this year as the Nation’s top linebacker after his 95 tackle season last year. On the outside linebacker spots Alabama is deep and talented with potential breakout players in Denzel Devall, Ryan Anderson, Tim Williams and Dillon Lee. For Alabama to be successful on defense this year one of these guys will have to step up as an impact pass rusher, the kind Alabama has lacked the past few years. On the last linebacker spot on the inside look for Reuben Foster to make an impact. He has all the ability to be Alabama’s next great linebacker, but will have to play with intelligence and instinctiveness. Shaun Din Hamilton should also get in the rotation after a successful freshman campaign. Finally, the biggest question of the Alabama Defense and their biggest weakness last year… the secondary. Nick Saban has done a great job recruiting top defensive back talent into Tuscaloosa, but now it is time for that talent to step up. Cyrus Jones has one of the cornerback positions locked up, but it will be a question who can step in for the other one. Tony Brown has all the talent and speed in the world, but will need to play more consistent than he did as a freshman. Bradley Sylve was benched a lot of last year after a rough opening start against West Virginia and Kevin White. Look for Sylve to get a lot more playing time this year in his senior campaign and have a bounce back year. Marlon Humphrey redshirted his freshman year after coming in as a highly touted recruit. Humphrey could enter the cornerback rotation for a unit that struggled all last year. There are also two freshman that could come in and possibly earn playing time with Kendall Sheffield and Minkah Fitzpatrick. 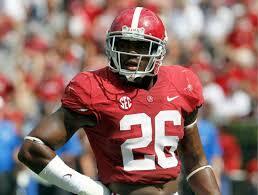 At the Safety position Alabama must replace both starters Nick Perry and 2nd round pick Landon Collins. In spring ball Eddie Jackson made the switch to safety after starting most of last year at corner. Against Ohio State Jackson was burned a few times, the move to safety I believe will be better for his physical traits and skills. Along with Eddie Jackson, Geno Smith is projected to start. Smith has had an up and down Alabama career. He has seen action since his freshman year, but will finally get a chance to start. That is if he stays out of Nick Saban’s doghouse after being arrested for his second DUI this off season. After those two, the next best bet at the safety position looks like Laurence “Hootie” Jones. Hootie has a strong safety build at 6’2 and 219 pounds. He had limited action last year after being a highly ranked recruit. The final position in Alabama’s defense called the Star position (nickel corner) will be filled by Maurice Smith and Jabriel Washington. For this defense to live up to their potential a few guys in the secondary will have to step up and play much better than last year.